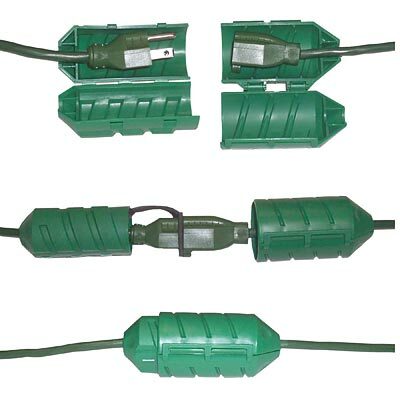 Keep your outdoor electrical connections safe from water using the Farm Innovators Watertight Cord Connector. This handy tool encases the male and female plugs of your light, pump, or deicer and extension cord in plastic for a safe and secure connection. The connector opens using a sturdy plastic hinge, allowing you to position your plugs. Add the watertight gasket to the male plug inside the unit, and screw both sides of the connector together for a secure junction. The plastic casing keeps water out of the items, and the dark green color blends with your landscaping. A small opening on each end accommodates the power cords. Protect your outdoor electrical connections from water using this Watertight Cord Connector. Made in the USA.